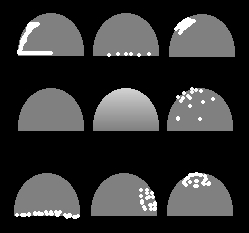 Example of how profile from bottom to top is attained. Line must be precisely 90 degrees. This can be carfully drawn by hand or a macro could be written to correct slightly angled lines. The cells gets narrower as it goes up (as a function of sqrt(x^2 + y^2) a.k.a. sin & cos) which makes the apparent intensity drop. Correcting for this intensity drop. An alternate way to do this might be to go back to measuring the cell in each slice where the user marks the bottom and top to fit results to a hemisphere and only pixels measured above a threshold value to adjust for not counting bg pixels, but I doubt the answer would be any more accurate.